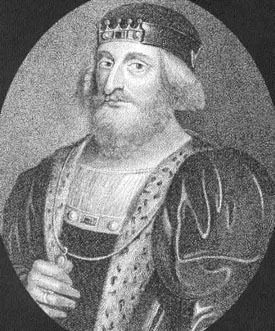 David II, King of Scotland, son of Robert the Bruce by his second wife, Elizabeth de Burgh, was born at Dunfermline on the 5th of March 1324. In accordance with the terms of the treaty of Northampton he was married in July 1328 to Joanna (d. 1362), daughter of the English King Edward II, and became King of Scotland on his father's death in June 1329, being crowned at Scone in November 1331. Owing to the victory of King Edward III of England and his protégé, Edward Baliol, at Halidon Hill in July 1333, David and his queen were sent for safety into France, reaching Boulogne in May 1334, and being received very graciously by the French king, Philippe VI. Little is known about the life of the Scottish king in France, except that Château Gaillard was given to him for a residence, and that he was present at the bloodless meeting of the English and French armies at Vironfosse in October 1339. Meanwhile his representatives had obtained the upper hand in Scotland, and David was thus enabled to return to his kingdom in June 1341, when he took the reins of government into his own hands. In 1346 he invaded England in the interests of France, but was defeated and taken prisoner at the battle of Neville's Cross in October of this year, and remained in England for eleven years, living principally in London and at Odiham in Hampshire. His imprisonment was not a rigorous one, and negotiations for his release were soon begun. Eventually, in October 1357, after several interruptions, a treaty was signed at Berwick by which the Scottish estates undertook to pay 100,000 marks as a ransom for their king. David, who had probably recognized Edward III as his feudal superior, returned at once to Scotland; but owing to the poverty of the kingdom it was found impossible to raise the ransom. A few installments were paid, but the king sought to get rid of the liability by offering to make Edward III, or one of his sons, his successor in Scotland. In 1364 the Scottish parliament indignantly rejected a proposal to make Lionel, Duke of Clarence, the next king; but David treated secretly with Edward III over this matter, after he had suppressed a rising of some of his unruly nobles. The king died in Edinburgh Castle on the 22nd of February 1371. His second wife was Margaret, widow of Sir John Logie, whom he divorced in 1369; but he left no children, and was succeeded by his nephew, Robert II. David was a weak and incapable ruler, without a spark of his father's patriotic spirit.